Like most of the other infections in the body, ear infection too is caused by bacteria or virus. Most of the times, this infection is in the middle ear. The infection in ear leads to various discomforts including pain and tugging at the ear, fluid coming out of the ear, difficulty in responding to sound correct, difficulty in sleeping as well as headaches, fever and even vomiting and diarrhea. Left unattended, ear infections can prove to be damaging as your eardrums may get ruptured and if there is a chronic recurrence of infection, you may even go deaf though this is an extreme case to happen. Because we always take note of any discomfort felt in any of our body parts. Same is the case with an ear infection. As soon as you feel anything that gives a clue about infection in your ear, you should take help of well-established home remedies to cure it. One of the studies conducted by Washington State University says that garlic is one hundred times more effective than two very popular antibiotics when it comes to elimination of bacterial strains responsible for food-borne illness. The study also says garlic works faster than any of us might think of. This study, thus, recognizes the age-old practice of using garlic as the first and the foremost home remedy for ear infection. If you still have a doubt, consider the fact that garlic has in itself the components called alliin and allinase. These components are a natural anaesthetic. There are quite a few ways in which you can use garlic to get relief from an earache and inflammation due to infection. Add the garlic cloves to oil. Heat the oil till the cloves turn black. Put off the flame and let the oil cool down till it becomes lukewarm. A temperature of the oil should be such which you can bear when it is poured into your ear. With the help of a clean (preferably sterilized) dropper, pour few drops of this garlic oil into your infected ear. You can even use a small spoon to pour the oil into the ear. You may or may not use a cotton ball to plug your ear so that the oil doesn’t come out of the ear. Add the garlic cloves to the water. Heat the water for about ten minutes in order to get softened garlic. Now take out the garlic cloves from the water and crush them to make a paste. Add a pinch of salt to the prepared garlic paste. Put the paste into the cloth piece and wrap it to make a poultice. Place the medicated cloth on to your infected ear for few minutes. Basil is a super anti-bacterial herb. If basil leaves are places somewhere, the surrounding environment gets clean of all the micro-organisms that may prove harmful. This is the reason why most of the Indian homes have a basil plant in their homes. If this herb is so effective, why not use it to cure your ear infection too. 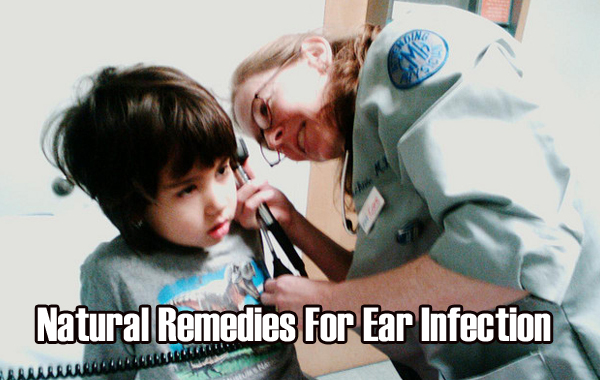 It can relieve you of the ear pain along with reducing infection. Here are some ways to use basil as a home remedy for ear infection. Crush the basil leaves and extract their juice. Now apply this juice on your ear. You don’t need to pour it into an ear, just apply on or around the infected ear. Soak the cotton ball in this oil mixture. Place the crushed basil leaves into the sieve and press hard to extract the juice. Now pour two drops of this basil leaves juice into your ear. Onion is one thing from the kitchen, other than garlic, that has been used since ages for an earache and ear infection. The same thing (read fumes) that make you cry while you cut onions may be the magical thing of onion that makes an earache vanish faster than you can imagine. While you can pour onion juice in the ear to eliminate the infection or you can make an onion compress. A choice is yours. Take out the juice of an onion. Pour few drops of this onion juice into your infected ear. Repeat this for twice or thrice a day. Cut an onion into two halves. Put them in the microwave and roast for about half to one minute. Remember, you just have to heat them a little. You can do it on a gas stove too. Now take the warm onions and wrap them into a cotton or woollen cloth (do not use synthetic cloth). Hold this cloth against your infected ear for about 10 minutes or till you feel the onion getting cold. This onion compress not only relieves you of ear ache but also prevents recurrence of ear infection. Tea tree oil obtained from the Australian tree Melaleuca Alterniflora is known for its excellent anti-fungal, antibacterial, antiviral and antiseptic properties. This is an essential oil and an essential oil should be used in a diluted form. In case of ear infection, this oil can be mixed with a carrier oil like almond or olive oil. Heat the mixture to make it slightly warm (only slightly). Now lie down on your side with your infected ear on the outer side. Place a towel under your head. Using the dropper, pour the warm mixture into your ear. Now turn your side and lie down on the other side with infected ear below so that the extra mixture drains out of your ear. Repeat this twice or thrice a day. You will be able to feel the results in about two days. Discontinue after 2 days. Mix all the three oils well. Apply this oil mixture with gentle hands around your infected ear to get relief from ear infection and inflammation. Lie down on your side with infected ear upwards. Pour the oil mix into your ear. Now turn and lie down on your other side to drain out the oil. Use a cotton swab if required to dab the excessive oil. Native to Europe and Asia, Mullein is flowering plant used as a herb for various medical conditions such as coughs, congestion, bronchitis, eczema etc. not forgetting earache and ear infection too. A study conducted on 171 children having ear pain way back in the year 2003 showed positive results. These children were administered with ear drops made with mullein, garlic, calendula, St. John’s wort, lavender, Vitamin E and olive oil. These children got relief from ear pain for three days. So, if you or any children at your home suffer from an earache or ear infection, you can make your own mullein oil at home. Here’s the recipe. Olive oil- enough to fill the jar leaving only half inch from the top. Take the clean mason jar and put mullein in this jar. Add all the other herbs- St. John’s Wort, Calendula flowers and garlic cloves. Fill the jar with olive oil leaving only ½ inches space from above. Close the jar and let the herbs soak into it. This is called infusion. Also, you must shake the jar every day without fail. If you see the oil getting lesser after some days, add some more. Mullein should be all covered with olive oil. A just ½ inch should be left at any time. After 4-6 weeks, strain the oil and store it another bottle. To use the oil, fill it in a small bottle with a dropper (sterilize the bottle and dropper by dipping them in hot water for at least 10 minutes). Pour 3-5 drops in your infected ear and let the oil rest there for about 15 minutes. Wipe off gently with a cotton ball. Use this infused mullein oil whenever you have an earache or ear infection.